In the year 1965 Srila Prabhupada established the wonderful tree of ISKCON. In due course of time Srila Prabhupada’s tree became so huge and bore wonderful sweet fruits. One such fruit is His Grace Shyamlal prabhu. He was indeed sweet and so gentle. His smile was so magnetic that people were always drawn to him. He always told me that I was his best friend. I was truly honored to be his one of his best friends. In Mahabharat, Sage Vidura is instructing Dhritrastra that there are 5 strengths. 1) one’s bodily strength 2) to have a good friend 3) money 4) good family members 5) wisdom. As my best friend, H.G Shyamlal prabhu always gave me strength in the form of his association,advice and always asking us to surrender to Srila Prabhupada. He was very dedicated to His Guru Maharaj. Shyamlal prabhu was also an exemplary householder. He took good care of his family and brought up his children to be sincere, kind and loving devotees. His dear wife Srimurti mataji, was always at his side,assisting him in his preaching efforts and in taking care of the devotees. Shyamlal prabhu , I will never forget your cheerful laughter, your compassionate nature and your humility. I,along with my wife Anandini devi dasi, and my daughter Gaurangi would like to take this opportunity to offer our deepest condolences. 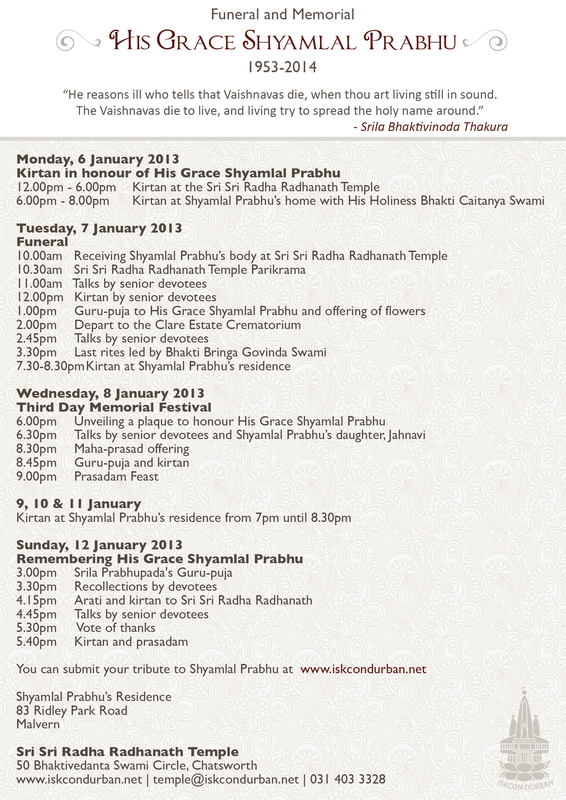 ISKCON worldwide will miss the presence of His Grace Shyamlal Prabhu. His Grace has returned back home,back to Godhead to serve Srila Prabhupada.